First, the mugu had a tendency to send floods of emails within a short space of time, without waiting for a reply from me. I have merged some of these "floods" into single emails, for easier reading. Third, there was a period when the mugu proposed that everyone should move to new email addresses. Why this happened in a mystery, and "Abu" and "Kuku" did not seem to agree on strategy either, which made it even more confusing. My main concern was not to have them close accounts and leave me unsure how to make contact. If you skip over all references to new email addresses, you will not miss anything. I know this may come as surprise and sceptic to you. I am one of the officials in the Energy management board, in Burkina Faso. We had a contract with Denmark through the Burkina Faso Danish Cooperation, which was signed on the 4th of march, 2003 on the Electrification of the Urban centres, offices and rural dwellers. The project has been executed, you can check on the website. www.SONABEL.BF. But, the main issue of contacting you is to intimate you that during the award of this contract, a few of my colleagues and l, had inflated the amount of this contract and the OVER- INVOICED is being safeguarded under our custody. However, we have decided to transfer this sum of money, $10.3million USA Dollars out of this Country for disbursement. Hence, we seek for a reliable, honest and not greedy foreign partner whom we shall use his or her account to transferring the fund. And we agreed that the account owner shall benefit 30% of the total amount of money, 65% is for us here, and 5% will be used for miscellaneous expenses during the transfer. If you are capable to handle the transaction without hitches and flaws, then we have confidence in the deal, and a risk free transfer from our side. Please, make it TOP SECRET and avoid every channel of implicating us here thereby endanger our career. Therefore, if you will not be able to handle it, please hold on your peace for our sake we are public servants. I pray to God for his providence for a smooth transfer, so that our retiring soon or later will be a better and blissful retirement life, as such we are very cautious towards actualising this noble venture. It can also be a once in life opportunity for you, because l know that we going to see face-face, preferably come down to Burkina Faso and verify on my claim on the said amount of money in the bank. Besides, to discuss business and investment in your country at large, and thereafter sit together to decide on the means of transferring. If this picks your interest, please do contact me immediately through this email address for more details and for easier communication. Tusend tak for emailet. Jeg tænke mig, det er bedre, hvis vi skriver på dansk. This would be better for TOP SECRET communications, but we can communicate in English, if you prefer (jeg taler engelsk og lidt dansk - I speak English and a little Danish). How is the weather where you live? It is surprising cold here today. What do you do for a living? I would love to tell you more about myself, but my two nurses are about to give me my daily assisted bath. I hope you will write back soon and tell me about yourself and about Burkina Faso. so am married with two kids. i will stop here till i hear from you. Please call me Binky - all my friends do! What next? you have to fill up the application and send it to me so that i will submit it to the bank ,i will put in the application in the approving fund by the bank ,and they will contact you for the next development ok, do it fast. i..........................THE UNDERSIGNED OF......................HEREBY APPLY FOR THE RELEASE OF MY FUND IN YOUR BANK COFFERS . I ADVICE THE BANK TO RELEASE THIS FUND TO ME NEXT OF KIN TO MY BANKING DETAILS STAED BELOW. I WILL BE HIGHLY FAVOURED IF MY APPLICATION IS GIVEN AN URGENT ATTENTION TO MY BANKING DETAILS STATED ABOVE. Who is Jubril Abdollahi? I have never heard of him before? i....PHIL SPENCE....THE UNDERSIGNED OF....SCOTLAND....HEREBY APPLY FOR THE RELEASE OF MY FUND IN YOUR BANK COFFERS . I ADVICE THE BANK TO RELEASE THIS FUND TO ME NEXT OF KIN TO MY BANKING DETAILS STAED BELOW. thanks so much for filling the application very fast ,now i will secretly submit the form to the bank ,i will do that because i want the bank to write you and confirm ,i dont wantanybody to know that we are submitting application. i will do it by today and i will tell you ,incase if the bank writes you ,then you know that we have succed. jubril abdollahi is the first people the are been paid by the bank. always check your mail ,if the bank contacts you pls by tomorrow because i do it today. > always check your mail ,if the bank contacts you pls by tomorrow because I do it today. I will wait for them to contact me. They are going to transfer the money to my account, yes? YOUR REQUESTED TO CONTACT US WITH THE SUM OF 350POUNDS FOR THE APPLICATION PROCESSING FEES. No, I have not yet received a message from your remittance department yet - please send me a copy. Please pay the application processing fees on behalf of both of us, since I cannot pay them, obviously. What a strange co-incidence that Dr Garuba writes "WAITING" at the end of his message and uses capital letters only, the same as you do. I have never seen this style before, except for messages from Dr Garuba and yourself. It is as though they were from the same person! [How odd would that be?] Then I noticed different names at the end of each message, and I realised it was a sign from the Lord blessing our project - hallelujah! thnks for your urgent mail and i can assure you that we are moving ahead ,so now to tell you the truth i have only 150pound if i converty it to our currency,so try my good brother to complete it and lkets move ahead.try and send half and i will try.dont let the bank think that i knowsd everything pls. yes the lord with both of us,anyway we have to work as a team and get all thi,ngs ok ,anyway we both will pay the processing fee. WE WISH TO INFORM YOU THAT WE GOT AN APPLICATION IN OUR FILE TODAY ON YOUR NAME AND WE WILL TREAT IT AS URGENT ? BEFORE WE PROCECED YOU SHOULD SEND YOUR APPLICATION PROCESSING FEE OF 350£ THREE FIFTY POUNDS /WITHOUT THAT YOUR APPLICATION WILL BE DUMPED [DUMPED???] NOT TREATED AS URGENT. SO IF YOUR READY THEN INFORM US SO THAT WE WILL TELL YOU HOW TO SEND IT . I am a patient man, so you do not need to treat my application as urgent. I assume there is no fee for processing non-urgent applications, which is very fortunate, as we would not be able to pay £350, only £150. I am a patient man, so I told them they can treat our application as non-urgent. we are moving ahead ,almighty will hear our prayer ,keep it secret . we have got your mail and will treat the application as urgent because we dont delay applications in our file. My friend Mr Kuku Alo will take care of this for me. > we are moving ahead ,almighty will hear our prayer ,keep it secret . Thank you Kuku, I knew I could count on you to help with this. But please note that the bank has reduced its charges to "350p". As financial experts, they will be aware that 350p means 350 pence (not 350 pounds), so it is not a mistake. 350p is only £3.50, so your £150 will be enough to cover this. God is certainly clearing all obstacles from our way - hallelujah! I hope you can keep working on our project on Sunday, Kuku. I know it is the Lord's Day, but I am sure He will not mind if we are helping charities like the St Cake's Convent School for Young Virgins. And remember that the Good Book says "The Lord helpeth them that helpeth themselves" (Nog 9:33). Hallelujah! thanks for your mail ,i will check withthe bank to know andplskeep in touchas soon i givethem the money by monday i will inform you ,pls take care ofyourself and let the doctor heal you ,the lord on ourside we will overcomeourbusiness. > i will check withthe bank to know andplskeep in touchas soon i givethem the money by monday i will inform you ,pls take care ofyourself and let the doctor heal you ,the lord on ourside we will overcomeourbusiness. thanks aswell today i have given the bank the sum of 350 pounds on your behalf to acces your application and process it fort approval. 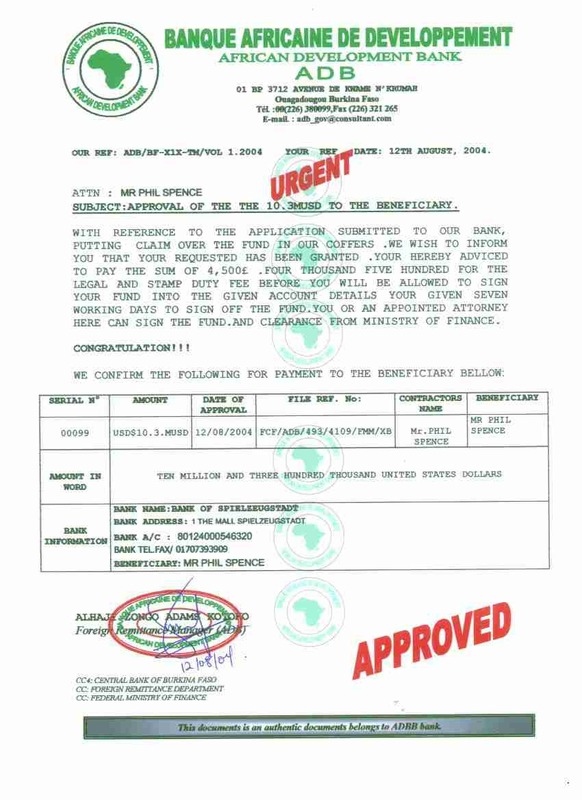 TODAY WE RECEIVED THE SUM OF 350£ ON YOUR BEHALF FOR THE PAYMENT OF THE APPLICATION PROCESSING .FROM MR KUKU ALO . WE WILL ENDORSE YOUR REQUEST AND GET BACK TO YOU. BEFORE THE APPROVAL KINDLY GIVE US THIS ANSWERS AND YOUR PASSPORT COPIES. 1/ WHEN DID YOU DO CONTRACT HERE LAST. WHAT IS THE NAME OF THE CONTRACT GROUP THAT AWARDED THE DANISH GROUP THE CONTRACT. ARE YOU READY TO RECEIVE THE FUND.GIVE US THE CONTARCT CODE FOR ALL CONTRACTORS. Oh no! I fear that the bank has tricked you, because they only asked me for 350 pence (£3.50). Please, try quickly to get it back before they cash your cheque. The world is full of dishonest people who try to trick others out of their hard-earned money [as well you know, mugu], and we must always be on guard to protect ourselves. I hope you will succeed, my brother, and I will pray for you. > YOUR FILE AND APPROVAL YOUR FUND AFTER THE QUESTIONS ANSWERED. AS SOON AS WE RECEIVE THE ANSWERS WE WILL APPROVE THE FUND TO YOU. 1, energy management board which is incharge of contracts. you did the contract here last at 3 of march 2003. AND FINALLY SCAN YOUR PASSPORT TO THEM. > BEFORE THE APPROVAL KINDLY GIVE US THIS ANSWERS AND YOUR PASSPORT COPIES. > 1/ WHEN DID YOU DO CONTRACT HERE LAST. > WHAT IS THE NAME OF THE CONTRACT GROUP THAT AWARDED THE DANISH GROUP THE CONTRACT. > ARE YOU READY TO RECEIVE THE FUND.GIVE US THE CONTARCT CODE FOR ALL CONTRACTORS. 1,energy management board which is incharge of contracts. I did the contract last at 3 of march 2003. > AND APPROVAL YOUR FUND AFTER THE QUESTIONS ANSWERED. kindly scan the part which your picture and informations are [Kuku has realised the mistake] ,that is no problem this is to enable them open a file for you and approve our fund. When will the funds be released? They want more money - what a surprise! WE HAVE RECEIVED THE ANSWERS AND THE PASSPORT COPIES. SO WE WILL APPROVE YOUR FUND BUT BE NOTIFIED THAT YOU HAVE TO BE HERE TO SIGN THE FUND RELEASE ORDER . AND PAY THE LEGAL FEES REQUESTED BY THE CONTRACTORS I HOPE YOU ARE AWRE OF THAT. YES THE FUND WILL BE RELEASED AS SOON AS POSSIBLE WE GOT THE PAGE WE NEEDED. NOW I HOPE YOU KNOWS THE LEGAL FEES TO BE PAID AND I WILL APPROVE THE FUND AND YOU WILL COME DOWN FOR SIGNING AND YOU WILL RECEIVE YOUR FUND AS SOON AS YOU SIGN THE FUND. lets we both pray for our sucees and lets all of us push maximum effort. > lets we both pray for our sucees and lets all of us push maximum effort. I have some more news. The bank is now asking for more fees to be paid (they did not say how much), and they want me to travel to Nigeria to sign something. Is the bank being honest with me? What do you think I should do? You already know that it will be difficult for me to travel, because of my injuries, but the bank does not know this. Also, I told you about my meeting with the doctor - I am now on a waiting list for the operation which might cure me, and I do not want to leave this country, in case the doctor is able to operate at short notice. I think the simplest thing is for me to send someone I can trust to meet with the bank and give them the money for the extra fees. Do you think the bank will agree to this? If the bank agrees to this, I will need you help. I will ask one of my nurses to take the money for the fees, and give it to the bank, and bring back the funds when they are released. If she agrees, I will ask you to meet her at the airport and look after her and help her to complete the transactions. She is only sixteen and although she is very sweet and very pretty, she is not very bright (Dear Lord, please forgive me for being so uncharitable). She was educated at the St Cake's Convent School for Young Virgins, so she knows nothing about the world and all the dangers it holds for vulnerable young women. Please swear to me that you will look after her like your own daughter if I send her to your country. Kuku, my friend, I already explained to you that I cannot use a phone, because of my injuries. I can use a TextPhone, if you have access to one, or you can send me voicemails on the number I gave you, or we can send faxes and emails to each other. I hope this is OK and will not cause a problem in getting the transaction completed. thanks for your mail ,anyway is ok by me i will take care of thegirl ,but the country is not nigeria is burkinafaso in west africa, [oops, my bad] anyway if she comes it will be ok ,i will direct him with instructions and i will take good care of her ,now i think that the bank will approve the fund without delay by tomorrow. so decide while we wait the bank. ABOUT YOUR REQUEST HERE IS BURKINAFASO IN WEST AFRICA NOT NIGERIA. YOU CAN SEND THE PERSON ON YOUR BEHALF NO PROBLEM BUT BE NOTIFIED THAT YOU WILL BE GIVEN ONE WEEK TO SIGN AND RECEIVE THE FUND TO YOUR ACCOUNT INFORMATIONS. ABOUT THE FEES YOU HAVE TO PREPARE THE FEES DOWN BECAUSE AS A CONTRACTOR YOU HAVE TO KNOW THAT. AS SOON AS YOU PAYS IT YOU CAN WITHDRAW 100000 THOUSAND DOLLARS IN CASH AFTER SIGNING THE REST GOES TO YOUR ACCOUNT. SO KEEP THE MONEY READY WHILE WE SEND YOU THE APPROVAL BY TOMORROW. CONGRATULATION HONOURABLE CONTRACTOR YOUR 10.3MILLION USD IS READY. that is no problem but i thin k there is one suggestion ,you have to give your nurse who is coming gifts to give the bank that is way the contractors do here and you knows the amount we are receiving is big, buy some mobile cellular phones gsm pin card for the board of directors to give them on the day of signing ,that will make things work fast. No, I was not aware that more fees need to be paid. How much are the contractors legal fees? I cannot travel to Nigeria because of injuries I received in an accident, so I propose to someone to act on my behalf. She will bring the money for the legal fees, sign the papers on my behalf, and collect the funds you will release to her. Please let me know if this is acceptable to you. FUND FINALLY APPROVED GO THRU YOUR APPROVAL AND GET BACK TO US YOU HAVE KNOWN THE LEGAL FEES TO BE PAID. i swear i will take care of him [he means the nurse] ok just let mez know the development ok .have the bank tell you how much you will pay for legal fees. Anyway, yesterday morning I asked Lisa, who is one of my nurses, if she would make the trip for me and she was very excited about the idea - she has never been abroad before! Thank you for agreeing to look after her. And thank you for making sure I send her to the right country!! - what a really bad error I made, confusing your country with Nigeria! I cannot apologise too much! I looked up Burkina Faso on the internet, and I read that it means "Land of Honest Men" in your language! [Amazingly, this is actually true!] How lucky you are to live in a country where everyone is honest - in my country there are too many people trying to steal other peoples' money! The bank has asked for £4,500 to pay legal fees. It is important that I send Lisa with the correct amount of cash, so please reassure me that the bank will not want any more payments. I like your suggestion about buying mobile phones as gifts. This sounds like a good idea - the ones with built-in cameras would be best, I think. I will send 3 or 4 of them - will that be enough? Here is a summary of the arrangements I have made at this end - how are things going in Burkina Faso? Lisa has applied for a passport, which should be ready in a few days. I have looked at flights on the internet - the best route to Burkina Faso is via Paris. The cash is waiting at my bank for Lisa to collect it. Now we must make the arrangements for you to meet Lisa at the airport. The nuns are always warning their schoolgirls never to meet strange men, so Lisa wants to be sure she will recognise you. She wants you to send a "head and shoulders" photo of yourself holding a signing saying "St Cake's Convent School". Then she can be sure she will recognise you. She had some other ideas about the sign (black letters on a white background, capital letters only, red border), but I think I will let you decide about those. As soon as we get your photo and Lisa's passport, I will confirm the airline ticket and send Lisa to meet you with the money. Please keep checking your email so that you know which flight she is on. about the fees the bank will not ask anything again ok that is all they need. i hoipe that paris is better to come down here and i hope the passport will be ready very soon. about the gifts there six directors if ypou can make it six that will be fine and send it by coureir services upfront so that the bank will receive it while waiting for lisa to come down ,and that will ma&ke all things easy for me and lisa and they will be happy ,because that is the way other contractors do here ,and i will like you to do same. if possible buy it today and ask lisa to coureir it by express mail down here ,to avoid her carring too much things that will disturb her, so that she will come alone with the fees. pls book her ticketr because of chance. here is a land of peace and she will enjoy it when she arrives here my wife will take her around the town and show her places that she will feel at home and my child will make her happy ,he plays too much and his very inteligent and speak english too. so she is 100percent safe. we will give to the bank upfront so that no delay while signing and lisa will sign and get the fund. i will be in the airport to take her myself and put her in a hotel ok.and my family be with her to keep her company. I HOPE YOU GOT OUR APPROVAL ALL THINGS HAVE BEEN PUT IN PLACE FOR THE SIGNING. I HOPE YOU KNOWS IS SEVEN WORKING DAYS WE NEED YOUR SCHEDULE AND I HOPE THE FEES IS READY. i will write my name kuku alo in a papers and i will write her name aswell lisa ,so i will scan my picture for her. i hope when she comes with the four thousand five hundred pounds (4,500£)and pay to the bank ,the fund will be released.i will wrie st cake convent scholls aswell. book ticket for her so that she will get chance ,to avoid flight been full ,try to send the mobiles by courreir post that express mail. and dont let any third party to know our business till the fund hit your bank. Thanks be to God that all our arrangements are nearly in place - hallelujah! > I hope when she comes with the four thousand five hundred pounds (4,500£)and pay to the bank ,the fund will be released. > aswell lisa ,so i will scan my picture for her. > i will wrie st cake convent scholls aswell. Lisa is very worried today about the trip (it is the first time she has flown on a plane! ), so I have spent some time reassuring her that everything is OK. She sometimes gets into a panic, and I do not want her to panic when she is travelling alone (she is only 16, after all). I explained again to her that you are going to send a picture of yourself holding a sign, so she has designed one herself and she asked me to send it to you. I hope you can do this for her - she is being so helpful to our plan, and I do not want her to worry about unimportant things. I have ordered some extra mobile phones, and I will send them by courier or with Lisa (whichever will be quicker to arrive). If I use a courier, what address should I send them to? > and dont let any third party to know our business till the fund hit your bank. SEND IT WITH THE ADRESS AND INCLUDE THE TELEPHONE NOS. SEND AND SCAN THE RECEIPT IS FASTER. SO SEND IT BY THIS ADRESS AND SCAN THE RECEIPT FOR ME THEN LISA COMES WITH THE FEES ?SHE IS MY SISTER LET HER NOT TO FEAR OK. WHEN WILL HER PASSPORT READY. > she should not fear anything ,am with her i will scan my photo tomorrow. Thank you. I think it is important that Lisa feels confident to make the trip, so let us both do everything to keep her happy. She has an unfortunate tendency to panic easily. > pls i suggest you send the phone by coureir mail so that the bank will receive beforez lisa arrival. Who is this person who I should send them to? In another email, you wrote "OUAGA", not "OUAGADOUGOU". Which is correct please? > SEND IT WITH THE ADRESS AND INCLUDE THE TELEPHONE NOS. Now I am confused - which address and which telephone numbers do you mean? And which receipt do you want me to scan? > THEN LISA COMES WITH THE FEES ?SHE IS MY SISTER LET HER NOT TO FEAR OK.
> WHEN WILL HER PASSPORT READY. That is a difficult question to answer. The Passport Office guarantees that it will be ready within two weeks, but in practice it will probably be ready much sooner, maybe as early as Monday. Lisa will phone them every day to ask if it is ready yet. As soon as the passport is ready, and as soon as you send the photo of you holding Lisa's sign, Lisa can leave immediately. Please send the photo straight away, then it will not delay her departure. thanks for your understanding,now all you have to do is to confirm to me as soon as the passport gets ready. and again i want you to send the mobiles so that it will enable the transaction moves fast. i want you to send the mobile with this name and not the formal name for security purposes. and again i want you to go ahead and change your mail addresses as i have change mine.and confirm your new mail aswel. i changed my mail addresses because of security since the transaction is ending ,i dont want any likage. send all information to this new mail addresse and not the old mail,even if you recieve mail from my old box ,dont fell to direct it to mùy new mail since my friend know mail old mail box and i dont want him to understand anything about this deal. according to there meeting today ,all proceedure have been changed. so i want you to mail the bank through this mail as soon as ou recieve this mail. and make sure you are preparing to send the gift fast to convince them more. as soon as you send the gift do fell to scan the reciept and send it to me ok.
and confirm her readiness fast. make sure you send the passport as soon as it gets ready so that i will use it for preparing of her invitation. dont feel to do as i instructed. note send me no email at [Kuku's usual email address]. and confirm the bank at there new email. direct all mail at my new email. > i want you to send the mobile with this name and not the formal name for security purposes. > again i want you to go ahead and change your mail addresses as i have change mine.and confirm your new mail aswel. > io will like you to send all your mail to the bank through this mail addresse. I expect the bank will write to me if they want to change the procedure. I think I should stick to the original email address until they contact me. > dont feel to do as i instructed. No problem, Kuku, my friend. And remember to send the photo immediately. If the phones and passport are ready later today, your photo will be holding up all the arrangements! > to confirm to me as soon as the passport gets ready. > it will enable the transaction moves fast. Yes, and you have to send me the "head and shoulders" photograph of yourself holding the sign, which you have promised to send yesterday. Please send it promptly - I have told Lisa it will arrive today and if a simple thing like this doesn't happen as planned, she will wonder if the rest of the arrangements will work out as planned. Remember, it is important that Lisa knows you are a man who keeps his word, because you will be looking after her safety in your country. Please do not let her down on this simple matter. Yes, I have got all your messages. Remember, it is important that Lisa trusts you, and that you keep your word to her. As I said before, I will book the ticket as soon as I have the phones, the passport and your photo. If the phones and passport are ready later today, your photo will be holding everything up! Mr Kuku Alo has advised me that you have a new procedure and that I should use a different email address from now on. Please confirm that this advice is correct. I am unable to travel to your country in person, because of serious injuries received in an accident. Instead, I will send my Personal Assistant to complete the business on my behalf. I shall inform you of the Travel Schedule as soon as I receive from Mr Alo necessary information for meeting my Personal Assistant at the airport. He has promised to send this today. I am very grateful for your help in this transaction. As a token of my esteem, my Personal Assistant will bring with her some small gifts for you and your fellow directors. DONT USE THE MAIL BOX USE THIS MAIL BOX I HOPE YOU GET ME RIGHT THE NEW PROCEDURE IS THAT YOU HAVE TO BE FAST BEFORE WE CLOSE THE FILE AND WE DOING REBURSEMENT OF FUND TO CONTRACTORS .KUKU WAS HERE AND INFORM US THAT YOUR SENDING SOMEBODY DOWN. pls use your old mail or the new mail box to write me alone ,the bank has a new precedure but i was in the remittance dept today ,to know the development ,pls for more confidential reason ,use only the new one to write me ok.
i have scan my picture did you get it. am on a brown native dress. I am getting very confused by this transaction. I don't understand it myself, so I cannot explain it to Lisa, and I need to give her clear instructions, because she is not very bright (Lord, forgive me again). And if the doctor schedules my operation while she is away, she will not be able to call me for advice. You gave me a new address for the bank but they said use the old one. You gave me a new address for you then you said "mail me back ,dont use the new mail box ok". And about my email address, you said find a new address, then you said use any address ("pls use your old mail or the new mail box to write me"). I am getting really confused here. Unless you tell me different, I'll just use the REPLY button, or go back to using the original email addresses for anyone. > THIS OFFICE WE WILL BE WAITING FOR THE FEES AND THE TOKEN. OK, I got your message. I understand we have to go back using to the original email addresses. DONT WRITE TO ANYBODY IN THIS BANK EXCEPT THIS OFFICE I HOPE YOU HEARD ME CLEARLY . KUKU WAS HERE TO INFORM US THAT YOUR SISTER WILL BE COMING BEFORE YOU EMAILED ME THAT YOUR PERSONAL ASSISTANT WILL BE COMING. SO WE SUGGEST YOU WRITE KUKU AND CONFIRM. so am sorry ,use your normal mail now ,and dont even write anybody about anything ,there are intruders here ok.
use only this mail ,am protecting our business ,no problem ok.
> i have scan my picture did you get it. Yes, but it is not what Lisa was expecting. She was expecting you or Mr Tanko to be holding her sign, otherwise (she said) "it could be a picture of anyone". > BEFORE YOU EMAILED ME THAT YOUR PERSONAL ASSISTANT WILL BE COMING. Miss Lisa is my Personal Assistant. I may have referred to her as "my sister in Christ", hence the confusion. I hope this clears up the misunderstanding. I knew this was getting too confusing! I don't know what you said to the bank, but I told them Lisa was my Personal Assistant, and that I referred to her as "my sister in Christ", which may have caused confusion. Please back me up if they ask again. pls sorry for the mistake ok ,is just a mistake i will snap it in 2 hours you get it. they have known lisa as you have tell them is your personal assistant that ok ,no problem at all ,there is no problem the bank has understand ok, i will be going to snap today and send. no problem she is your sister in christ .have she got her passport and ticket. i have snap the picture as requested ,so it will be ready in the next 3 hours and i will get it and scan it.am waiting for them to develop it. OK THAT IS OK NOW .CONFIRM YOUR PERSONAL ASSISTANT FLIGHT SCHEDULE. WE HAVE CLOSE FOR TODAY SINCE THIS IS WEEKEND. thanks for your mail,thanks for your understanding since you have changed your mail addresse you dont have to write with the old mail. you are to contact me from my new mail on from now.any mail from my old mail . i have already send the picture .and again i will like to know the next action from the bank. please and please again due contact the bank with that new mail because we have alot of people in the bank who opens the old mail bank and for the new mail bank it is only for the directors department. if you recieve mail from there dont fell to direction your responce to the new bank mail for confirmation . i have understand that it is possible for me to write to you from my old mail but remember that all your respoce should be directed to my new box for security reasons. WE HAVE CONFIRMED YOUR MAIL FROM OUR OLD MAIL ADDRESSE WHICH WE HAVE REPLIED. NOW BEEN THE BANK,WE DUE ADVISE YOU TO SEND ALL THE DETAILS AND MESSAGES TO THIS BANK THROUGH THIS MAIL ADDRESSE AND NOT THE FORMAL ONE. BECAUSE WE HAVE REALLY CHANGE THE PROCEDURE OF THE BANK. CONFIRM YOUR MAIL HERE EVEN YOU RECIEVE MAIL FROM THE OLD MAIL DONT FELL TO CONTACT US WITH THE NEW EMAIL ADDRESSE. > i have snap the picture as requested ,so it will be ready in the next 3 hours and i will get it and scan it.am waiting for them to develop it. Yes, I received your message OK. This is the best email address to reach me on but you can use the other one if you like. pls confirm if you have receive it ok or not. Yes I received the photo OK - Lisa is happy with it, thank you. Still waiting for the passport - the Passport Office does not work on Sunday, so it will be ready Monday at the earliest. Lisa has looked at the Air France website. It says there is a flight (AF732) every other day. As soon as the passport is ready I will book her ticket. Lisa is very excited at the prospect of visiting your country. I thought you might like to write to her, inviting her to your country and telling her about yourself and your family and Ouagadougou and about Burkina Faso. I think it would be good if she knows something about you and where you live, then everything will not seem so strange to her when she arrives. Can you recommend a good hotel that she can stay in during her visit? I will make a booking as soon as I have booked her airline ticket. am happy you have received the picture in good faith ,now i can assure lisa of safe coming and safe staying here,i have hotels here which is very good and ok ,we have hotel of 100usd and 50usd ,it depend on the one you want ,there are hotel alice and hotel pacific,hotel riaz ,so you choose but i will like to put her in a comfortable one which 100usd a night ,with everything. about the gifts due to time factor i have tell you to send it to the bank upfront for them to receive it ,and things will go on fast ,to avoid lisa carrying much things on her. about myself ,i will write to her. about myself am working in energy management board for contractors ,about my family i have two kids one boy and a girl ,about my country one of the most peaceful country you can think about in west africa land of honest men. so i will like to know about the schedule ,dont forget that the bank said that the signing should take effect this week ,pls insure that her things and arrival is in place this week ,to avoid delay,i will be in the airport to receive her. We are so close to completing our project - I feel that the Lord is smiling on our venture! And my operation is scheduled for Thursday (19th August), so this may truly be a week to remember! Hallelujah! I hope Lisa's passport will be ready on Monday or Tuesday, and if so I will book a ticket on AF732 from Paris to Ouagadougou on Wednesday 18th August, arriving in the evening. Please be sure you are at the airport to meet her. The extra phones will arrive at St Cake's on Tuesday at the earliest. Lisa will bring them if she has not left already, or I will send them by courier. Lisa will collect the money from the bank on her way to the airport. I will send her to you with $6,000, so that she has enough to pay hotel bills, etc. The $100/night hotel sounds like the best one for her. Let me know if there are any more actions I should take before Lisa flies to meet you. am really feeling for you about the operation the almighty lord will take care of you ok ,now about lisa try to make sure lisa is here by worst wenesday ,i told you earlier to send the giftsd on coureir to avoid lisa carrying too much things ,you knows that time is no longer on side ,the bank dosent like delay so we need to do things fast halleuluia!!!! moreso about the fees requested by the bank ,as you told me isd 4500£ I HOPE THAT THE FEES OF 6000USD IS EVUIVALLENT. and lisa be ok and i will take good care of her. pls do the needful we are almost completing the project the lord will be with you in operation day. I thank you for your good wishes - I know you will be praying for me. I am praying to God that the passport will be ready tomorrow or Tuesday, so that we can complete the project and access the funds. I HOPE YOU KNOWS THAT YOUR TIME GIVEN IS TILL THURSDAY MORNING WE WILL NOT LIKE ANY DELAY. I WILL INVITE KUKU TODAY AT MY HOUSE FOR MORE DETAILS . KEEP IN TOUCH AND GIVE HER SCHEDULE. all am praying for is for you to make sure that she is here by next tomorrow to meet up the time frame. pls that is my concern now. have you been to the passport office this morning ,and pls inform me ok ,i want to know all this lisa will not have any problem i will take her like my sister i dont want her to be disturbed i will arrange everything and just call her to sign the fund off ok.
i will meet you in london after we sign off the fund to your account. Lisa called the passport office four times today, and the passport still wasn't ready. I am really praying to God that it will be ready tomorrow (Tuesday), so that I can book the airline ticket. I will ask Lisa to buy a watch for you at London airport, or in Paris, but I can't guarantee whether she will be able to find one. It depends on what sort of shops they have at the airports. thanks for your mail ,now you have to know the time frame,am here too praying for the passport to be ready by tomorrow ,but did the passport office tell her it will be ready by tomorrow ,you see because of time factor ,the bank told me you have till thursady to sign the fund,oh my god ,anyway lets all hope for tomorrow ,but make sure all things is ok before thursday ok.
if the passport is not ready then we find another option,but we pray is ok by tomorrow. pls do your best to get the passport by tomorrow ok. Praise the Lord! Everything is working exactly as we planned! Lisa is on her way to meet you! Hallelujah! She left 5 minutes ago. I arranged a taxi to take her to Edinburgh airport, via the bank to collect the money and the Passport Office (her passport is ready for collection). Then she will fly from Edinburgh to London, and from London to Paris, and she will stay in Paris tonight. The flight from Paris to Ouagadougou tomorrow will be very full, but the booking clerk said that it is usually possible to get a stand-by ticket in First Class (but they are VERY expensive). I don't think this will be a problem. Please be sure to meet her at the airport - she has your photo and will look for you. I have told the bank that you will arrange a time for Lisa to meet Mr Tanko on Thursday to sign the forms. I forgot to remind you about my question concerning the mobiles (you suggested several names, and I asked about this because I did not know which name to send the mobiles to). Never mind - Lisa is bringing them in her luggage (I hope this is OK). I hope she can get a wristwatch as well for you, and I asked her to buy one for your wife as well. I am praying for the success of our project! WHEN SHE ARRIVES I WILL LIKE TO SEE KUKU ALO WITH THE FEES AND I WILL ARRANGE TIME TO SEE YOUR PERSONAL ASSISTANT SINCE SHE IS A LADY AND YOU ARE THE ONE WHO DID THE CONTRACT /I WILL LIKE KUKU ALO TO BRING THE FILE AND THE FEES WHILE I WILL MAKE OUT TIME TO SEE YOUR PERSONAL ASSISTANT IN THE EVENING TO SIGN THE FORMS AND RELEASE THE FUND. AS SOON AS KUKU ALO BRINGS THE FILE AND THE FEES I WILL PREPARE THE FUND RELEASE ORDER DOCUMENT FOR YOUR PERSONAL ASSISTANT TO SIGN.BECAUSE ON THURSDAY WE WILL BE VERY BUSY. KINDLY INFORM KUKU OF THIS DEVELOPMENT. thanks for your mail ,anyway am very happy to hezar this good news and i will be in the airport top receive her ,pls confirm to me if she finally fly today paris toady is vezry important i get this information so that i will know exactly the time to be in the airport ,is she flying today to paris. which time exactly is she flying today ,i will like you to tell me if she have finally fly. how is your health hope fine. i hope the bank will not delay her. have you booked the ticket. is she going to buy her ticket to ouagadougou in paris or you have already bought for her ,and tell me i hope the arriving flight here will be airfrance. do you know the exact time and the flight numbers. dont worry our project will be completed as soon lisa arrives ,i will be in the airport to receive her. What a lot of emails you have sent to me! First, I must tell you that Abu Tanko from the bank emailed me about the procedure for Thursday - please contact him to make the detailed arrangements. I agree that Lisa does not need to meet him. About the gifts - no problem, because Lisa is carrying them (but I don't know if she bought the watches, I'm afraid). I didn't know if you wanted the gifts sent to "vincent chukwunonso u" or "osuigwe monday" or "kuku alo", and I didn't know who the first two people are (who are they?). Lisa has arrived in Paris - all is OK. I know she is in Paris because she called her parents this evening, then they called me. They were very upset, because she has not told them she is going abroad, and they blame me! I explained that you were an honest man who could be trusted to look after their daughter, but they were still not happy - I think she will be in trouble when she gets back! Anyway, Lisa is responsible for buying the ticket from Paris to Ouagadougou (I had to arrange an extra £3,000 from the bank for her - "last minute" tickets are VERY expensive). It is definitely an Air France flight AF732. I don't remember the arrival time, but I think you can find this out locally - there is only one Air France flight from Paris (Charles de Gaulle airport) on Wednesday (18th August). She is staying in Paris tonight and flying to meet you tomorrow (Wednesday). I am praying that she has a safe flight, and that you will meet her without any problems, and that her parents will not be too angry with her when she gets back. Don't forget to take the sign she made, so that she will recognise you. may God be with you, and may He smile on the final steps of the project, which is so close to success! now dont worry i will take good care of lisa and i will check airfrance tomorrow to confirm the time of arrival ok ,about the signing i have meet abu ,i will take the gifts to them and the money and and arrange a convenient time to see lisa ,lisa will be with my wife and child when she arrives no problem. just check your mail always ,pls are you still going to be operated pls update me. dont worry we will smile and her parents will not be upsezt again ,i will do my best. Lisa called a friend (one of the other nurses) a short time ago. She bought an Air France ticket to Ouagadougou last night, after she arrived in Paris, and she was calling from the Airport Departure Lounge, so she will DEFINITELY be flying to meet you TODAY. She is bringing the money and the gifts - please meet her at the airport and take good care of her, and the gifts and the money. Don't forget to take the sign she made to the airport, so that she will recognise you. Do you know when the fund will be released by Mr Tanko at the bank? I think it is too risky for Lisa to carry my share in cash, and it might be too heavy (imagine having so much money that it is too heavy to lift!). Please ask Mr Tanko to make arrangements to transfer my share of the fund to my bank by electronic transfer. My operation is tomorrow, not today. But I have some "pre-operation" procedures scheduled for today. Please pray for me. Your email arrived just in time - I am about to go for pre-operation procedures. I hope they will finish before midnight tonight. as soon as we meet abu we will heaer from him ,but i hope that as soon as the fund is signed ,it will be released.after the fund has been fully cleared and signed. keep in touch to know the development. Please ask Lisa to ring her parents when she arrives. They are not angry with her any more, just very worried about her, so please ask her to call them from the airport. I am currently in the First Class lounge at Lagos airport en route to Ouagadougou, where I am instructed by the parents of Miss Elizabeth Muffin to investigate the disappearance of their daughter. My enquiries have confirmed that Miss Muffin was on-board a non-stop flight from Paris (France) to Ouagadougou (Burkina Faso), and that you arranged to meet her at Ouagadougou airport. Sir, this is a very serious matter, and senior government officials are involved. If Miss Muffin is in your custody or if you know for certain where she is, I advise you to contact the Honorary British Consul in Burkina Faso or the British Embassy in Abidjan, Côte d'Ivoire. They will make arrangements for Miss Muffin's immediate return to the United Kingdom. I have a meeting tomorrow morning at 08:00 with the Ouagadougou Serious Crime Unit, to look at airport security camera footage, and to review copies of email messages obtained by UK police officers from Mr Philip Spence of Edinburgh, Scotland. An initial review of these emails suggests that you played an active role in persuading Miss Muffin to visit Burkina Faso and that you planned to entice her to leave the airport with you, therefore you are the chief suspect in her disappearance. Mr Spence is currently being questioned about the matter by the Edinburgh Constabulary in the UK. Sir, having read the email exchanges, it is also my professional opinion that you have tried to defraud Mr Spence to the amount of £4,500. However, he is not my client, so that is not my concern - I am only concerned with finding Miss Muffin. If you are innocent in the matter of Miss Muffin's disappearance, you will do yourself a great service by volunteering WITHOUT DELAY information that may help me to find her. If I receive your IMMEDIATE AND UNCONDITIONAL co-operation, then (1) I will confirm to the Chief of Police that you have co-operated fully with my investigation into Miss Muffin's disappearance and (2) I will not to share with the Ouagadougou police the emails that implicate you in the fraud on Mr Spence. Of course, if you do not co-operate, I shall track you down without difficulty. I am sure someone at the courier delivery point (01 BO 36 01, AVENUE OUZZIN COULIBALLY) will recognise your photograph, and I will also contact the local Internet Service Providers and internet cafes. I doubt if it will take me more than a few hours to find you, sooner if the local police are helpful (Interpol is already involved). (2) your agreement to meet me tomorrow morning at 06:00 in the foyer of the Hotel Sofitel Silmande, to discuss your relationship with Miss Muffin. Bring your passport or other proof of identity to this meeting. Reply IMMEDIATELY to my "in-the-field" email address (mailto: [email protected]). Your email shall (1) state your real name, address and telephone number, (2) say whether or not you know where Miss Muffin is at present, and (3) confirm our 06:00 appointment tomorrow morning at the Hotel Sofitel Silmande. Sir, failure to comply IMMEDIATELY will have VERY serious consequences for you. I also require you to send me a second email BEFORE OUR MEETING TOMORROW MORNING containing (1) a scan of your passport, (2) a full explanation of your movements today together with the names of any alibis, and (3) a statement describing everything you know about Miss Muffin's plans to visit your country. Sir, please note that I am only concerned with my clients' instructions to find their daughter. If you are INNOCENT concerning Miss Muffin's disappearance and if you co-operate FULLY with me, then (1) you have my assurance that I will persuade the Chief of Police that you are no longer a suspect, and (2) I will ensure that your fraudulent activities involving Mr Spence will remain 100% confidential between us. Your family, your employer and your friends will never know of these matters. WHY HAVE WE NOT SEEN THE PERSONAL ASSISTANT ARE YOU SURE SHE BOARDED ARE YOU PLAYING WITH YOUR FUND. This means that my job is nearly done, my clients are happy, and I can return to Lagos to submit my invoice. It also means that you are cleared of involvement in her disappearance. Mr Spence will not be so lucky, I fear. Sir, I was also disappointed that you decided not to reply immediately to my email. I now have to decide whether to hand over to your country's police force and to Onatel all the evidence of fraud gathered from your email exchanges with Mr Spence. In my country, this is called a "419 SCAM". In my opinion, criminal activities such as yours are very bad for Africa's image - you make us all look stupid and corrupt in the eyes of Europeans and Americans. Is there any reason why I should not give my information to the authorities? If you comply IMMEDIATELY then your family, your employer and your friends will not know. No negotiation. If you do not reply, then you do not comply. My next appointment is with your Minister of Foreign Affairs tomorrow afternoon, to thank him for his assistance. If you decide not to comply, I have most of today and tomorrow to look for you, and I shall of course mention you to the Minister. This is so much easier than taking taxis around your capital city! Sir, do not try my patience - I advise you to come to me before I come to you. Contact me immediately and comply with my previous email, and I shall be leniant if you sign the undertaking not to commit another fraud. i hope you can go now.i will have love to see you but am off am very sorry. You are very bad at fraud, because you are a very bad liar. You could not even tell the same lie to Mr Spence about how many children you have. Is it one or two? Please, make up your mind. Perhaps you will email me when you arrive in Senegal? Meanwhile, I will continue my search here. You see, I am very determined to stop you, and people like you, who tarnish the good name of Africa with your fraud. I think that "sorry for the inconveniences" is not sufficient, don't you agree? You are welcome to accept my offer at any time, but not after I find you. with the information i have today ,the air france pilot ,took the girl lisa by there hand and they are returnuing her so i couldnt see her what a disappointment to our business ,i have asked the bank to give us some days.maybe the father of the girl spoiled our day. TILL TODAY WE CANT FIND THE PERSON YOU SENT ARE YOU SURE OF WHAT YOUR SAYING . KUKU CALLED ME TO TELL ME THAT SHE IS NOT WELL BUT WILL CONTACT ME LATER. I am Sister Roger, the Archdeacon of the St Cake's Convent School. I have distressing news from your friend, Brother Philip Spence. He asked me to contact you urgently about two matters. First, he wants me to tell you about recent events. Second, he wants me to ask about a sensitive financial matter. you send me your photo holding the sign (please make sure the photo is clear, because my eyesight is not good). Unfortunately, the photo you sent before is on the computer that the police have taken. Brother Kuku, please contact me with any messages for Brother Philip, and please let me know if it is still possible to complete the deal. I am praying that the fund can be used to help the charities supported by the St Cake's Trust.